From small businesses to larger facilities, get robotic cleaning, fleet vehicle services, and fast support. For our road projects, or Projects Division, our personnel are easy to identify in orange high visibility jackets and gear. TEAM Group offers quick turnaround, providing tailored solutions for diversified industrial cleaning, maintenance. 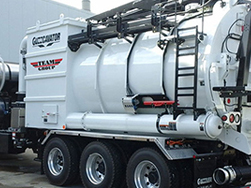 We use wet and dry vacuum trucks. Experience safer cleaning with advanced technologies that extend your equipment life, like our Ready Jet® concrete ready-mix drum cleaning service. At TEAM Group, we believe in the power of choosing safer industrial cleaning methods. 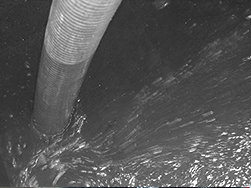 Cutting-edge Ready Jet® UHP removes heavy buildup of hardened, dead concrete from the drum–as opposed to manual chipping. Experience the outstanding results of remote controlled accuracy, and improved mix quality. As experts in the industrial cleaning business, we offer the broadest selection of solutions to the production industries. Manufacturing, refinery, construction– we do it all. When it comes to performing professional entry of confined spaces, some services include automotive dip tanks and ovens, air ducts, stacks, to access shafts, utility vaults, hoppers, vats, and much more.